22 MMS January 2017 mmsonline.com ONE-OFF Commentary I'm pleased that there remains continued interest in our Top Shops benchmarking initiative, which includes an annual sur vey and awards program. In fact, our seventh-annual online survey at survey.mmsonline.com/topshops is now live and will be open through February 28. Over the years, we've maintained a core group of shops that routinely participate. 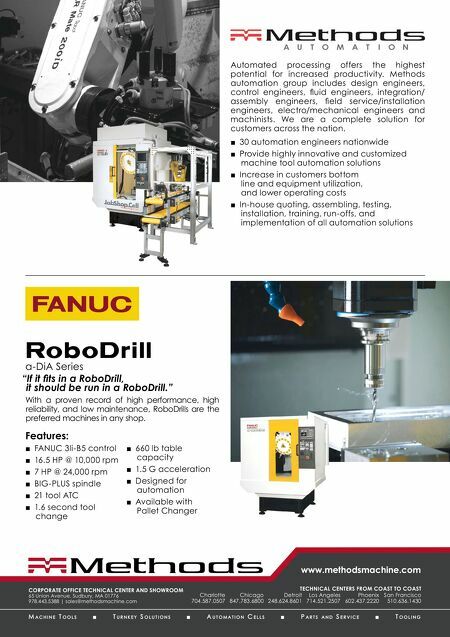 However, we also get an influx of new shops each year, which is why I put together this list of key numbers for everyone to keep in mind: 4—The survey is divided into four categories: machining technology, shopfloor practices, busi- ness strategies and human resources. We do not ask for specific financial figures such as gross sales or net income. Instead, we ask shops to supply financial measures as percentages, including net income per gross sales, annual sales growth rate and capital equipment expenditure per gross sales. Our thought is that this will encourage greater participation from shops that aren't inclined (or allowed) to provide specific financial data. Nonethe- less, all survey responses will remain confidential. 20—For each survey, we establish a Top Shops benchmarking group representing the top 20 percent of participating machine shops, determined by totaling the points assigned to select business- and technology-related questions. 4 (again)—After the survey closes, we'll gener- ate and provide a total of four data reports. Three of these are sent only to participating shops. These cut the data into categories including type of machining business (job shop, contract shop or captive operation), number of employees and number of parts produced. In addition, we create an Executive Summar y, comparing responses between the Top Shops benchmarking group and the rest of the survey participants (survey partici- pants receive a hard copy of this summary). That way, you can see how your shop's key performance indicators, such as net profit, spindle utilization and so on, compare with industry leaders. You can also see what types of equipment, processes and strategies those top-tier companies are leveraging. Doing so will help identify and prioritize your future improvement efforts. 37—The Top Shops initiative includes an Honors Program award, which has been presented to 37 shops thus far. The Honors Program highlights successful participating companies in each of the survey's four aforementioned sections, iden- tified by responses to select questions and follow- up interviews by me. Those shops are profiled in Modern Machine Shop and on our website. In addition, we offer a prize package that includes a large Top Shops banner that can be displayed in your shop, T-shirts, hats, toolbox magnets and so on. We also provide winners with a press release template that they can modify and send to various press outlets to get the word out about winning their award. 1,946—The Top Shops benchmarking program spurred the idea to start a Top Shops LinkedIn group. At the time of this writing, our Top Shops LinkedIn group had nearly 2,000 members. This group is for decision-makers in U.S. machining Top Shops by the Numbers The seventh-annual Top Shops benchmarking survey is now live. Here's helpful information for those who have participated in the past and those who haven't. 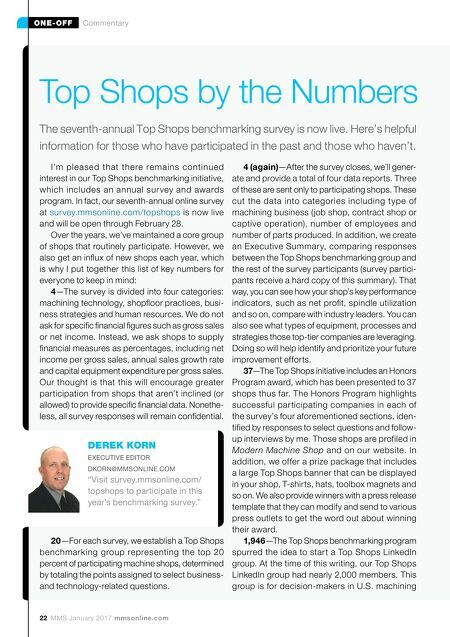 DEREK KORN EXECUTIVE EDITOR DKORN@MMSONLINE.COM "Visit survey.mmsonline.com/ topshops to participate in this year's benchmarking survey."